Most ranger-led programs on the parkway are free. Fees are required for some activities at Glen Echo Park, including carousel rides, theater shows, and dances. You may bring your pet with you to the park. With the exception of service animals, pets are not permitted in historic homes, in visitor centers, or on ranger-led programs. At all times, pets must be restrained on a leash no longer than six feet in length. Leashes protect dogs from becoming lost and from other hazards, such as sick, injured, or rabid animals. Leashes also help protect park resources, including wildlife and vegetation. Pet owners are responsible for disposing of pet waste in a trash can. The George Washington Memorial Parkway stands as a memorial to George Washington. It connects historic sites from Washington's home at Mt. Vernon, past the nation's capital, to the Great Falls of the Potomac, where Washington demonstrated his skill as an engineer. Along the way, visitors to this historic roadway can explore our Nation's history, from George Washington to World War II and beyond. These places are all linked by this planned and landscaped road, the first section of which was completed in 1932 to commemorate the bicentennial of George Washington's birth. Considered a commuter route by many local residents, the Parkway offers the traveler much more than convenience. 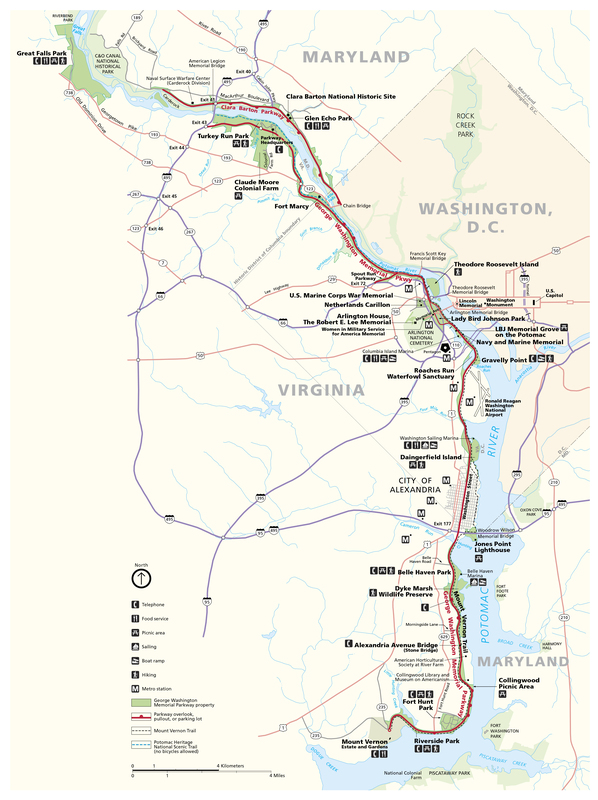 It is a route to scenic, historic and recreational settings offering respite from the urban pressures of metropolitan Washington. The parkway provides a pleasant day from Mount Vernon to Great Falls, passing through the same lands George Washington frequently traveled by horse. The Parkway links a group of parks that provide a variety of experiences to more than 9 million people each year. There are many ways to explore the Parkway. Ranger led programs are available year round daily at Great Falls Park, Clara Barton National Historic Site, Glen Echo Park, and Arlington House. Programs are available by reservation at many other locations including Turkey Run Park, Fort Marcy, Theodore Roosevelt Island, Lyndon Baines Johnson Memorial Grove, Dyke Marsh, and Fort Hunt Park.